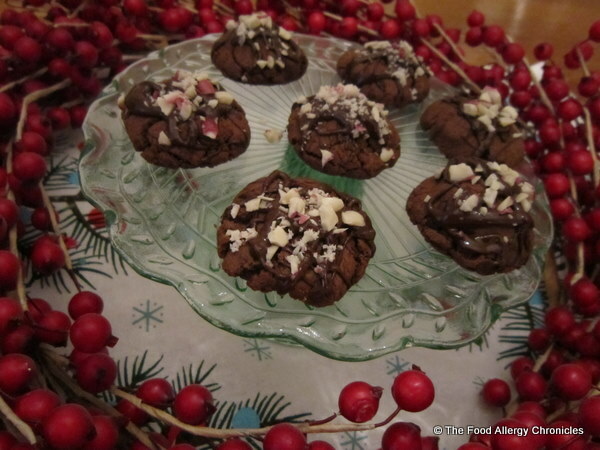 Posted on December 24, 2012 by Susan H.
‘Twas the day before an allergy friendly Christmas and all through the house, my boys have been itching for todays great excitement…the imminent arrival of my brother, sister-in-law and nephews arrive! My boys are ‘over the moon’ excited! Estimated time of arrival…before lunch! I better get busy…there is still the prepping of the Dairy, Egg, Beef and Peanut/Tree Nut Free Stuffing for our grand farm fresh turkey, baking Dairy, Egg, Soy and Peanut/Tree Nut Free Banana Bundt Cake and the ‘piece de resistance’ for our Chrismas Day dessert…Dairy, Egg, Soy and Peanut/Tree Nut Free Chocolate Yule Log. 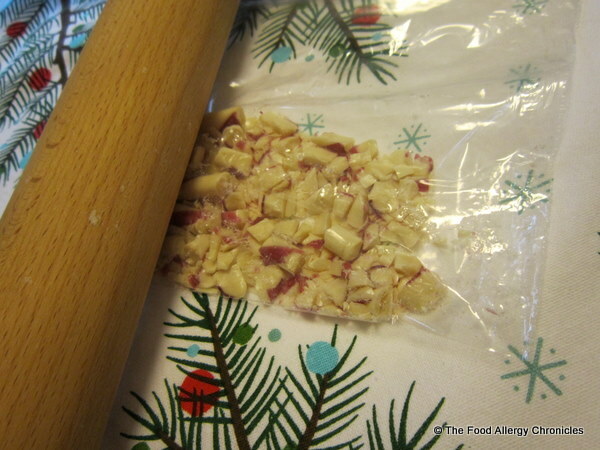 Good thing all my allergen friendly christmas cookie baking is complete. Wishing you all a Merry Christmas and a Happy New Year from our family to yours this holiday season! Dairy, Egg, Soy and Peanut/Tree Nut Free Sugar Cookies Are A Hit! Posted on December 21, 2012 by Susan H.
Dairy, Egg, Soy and Peanut/Tree Nut Free Sugar Cookies represented Matthew’s Scottish heritage…my father’s side of the family…for his contribution to his geography class’s Cultural. Packaged in an old St. Michael’s Scottish Shortbread tin…they were a huge hit! Matthew and I spent an evening ‘painting’ melted Enjoy Life Chocolate Chips on half of the Dairy, Egg, Soy and Peanut/Tree Nut Free Sugar Cookies. Click here for the recipe. While we waited for the chocolate to dry…Matthew helped me bake the other half of the Dairy, Egg, Soy and Peanut/Tree Nut Free Sugar Cookie dough into his favourite Dairy, Egg, Soy and Peanut/Tree Nut Free Chocolate Chip Snowballs! 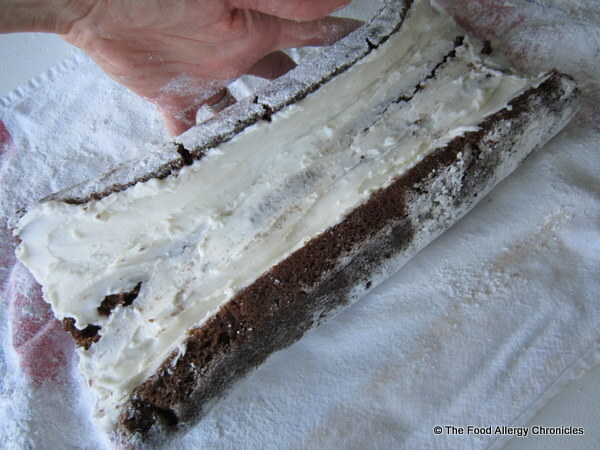 Rolling them in icing sugar while they are still warm…they cooled alongside the drying chocolate. Tomorrow is all about Gingerbread Men… Dairy, Egg, Soy and Peanut/Tree Nut Free Gingerbread dough is all made and resting in the fridge ready to be rolled, cut out and baked into various holiday treats! Click here for the recipe. 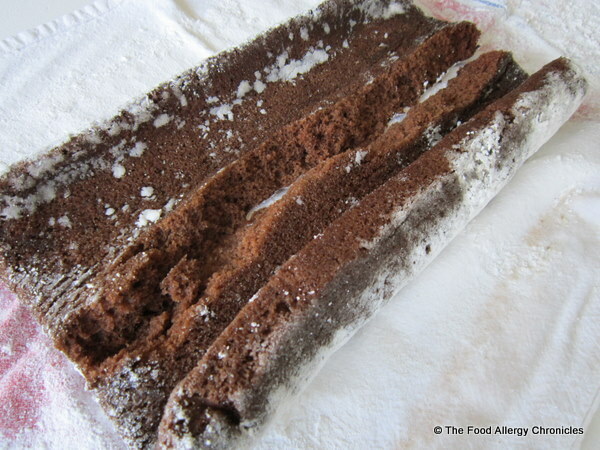 How is your allergy free holiday baking coming along? 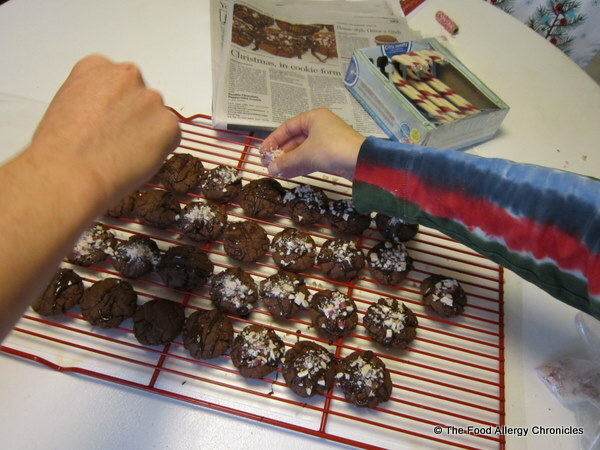 Posted on December 19, 2012 by Susan H.
As much as I am enjoying adapting and baking along with The Toronto Star’s 2012 Cookie Calendar Countdown…it is time I started baking and stocking up on some of my family’s most requested allergy friendly baking for Christmas. Michael has long finished his favourite…Dairy, Egg, Soy and Peanut/Tree Nut Free Gingerbread Men and just the other week, Matthew put in his two cents worth of hinting, “I think it is time for Chocolate Chip Snowball Cookies.”…he is right. I will use half the batter to bake the Dairy, Egg, Soy and Peanut/Tree Nut Free Sugar Cookie cut outs dipped in chocolate (melted Enjoy Life Chocolate Chips)…while the other half will have Enjoy Life Chocolate Chips added to the batter to be baked into Matthew’s favourite cookie…Dairy, Egg, Soy and Peanut/Tree Nut Free Chocolate Chip Snowballs. I am hosting our family’s Allergy Friendly Christmas Dinner this year…although it is a lot of prep and work…I relish the thought of doing it all in my own kitchen, with my own kitchen supplies, and minus the travelling. 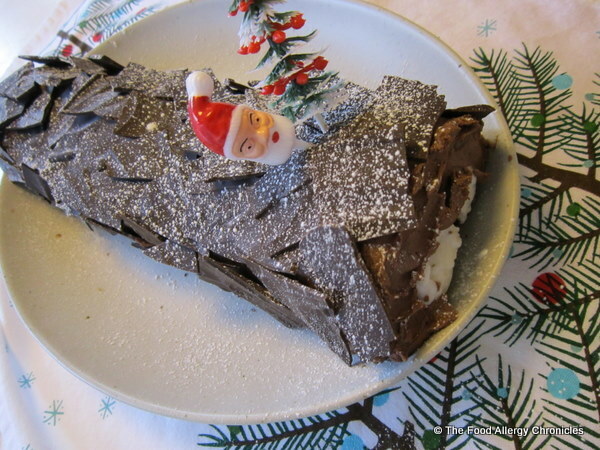 I hope to bake my Dairy, Egg, Soy and Peanut/Tree Nut Free Chocolate Yule Log for our Christmas dessert…if time runs out, I can always pick up a frozen Guardian Angel Chocolate Yule Log at my local Metro which is free of peanut/tree nuts, dairy and eggs. I hope to post photos along the way…stay tuned! 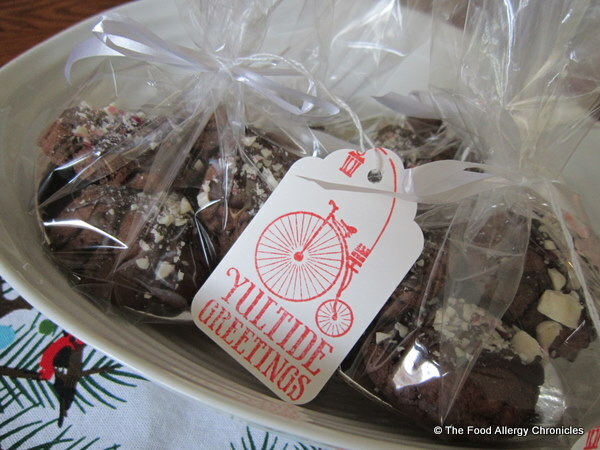 How are your plans for an allergy free holidays going this season? 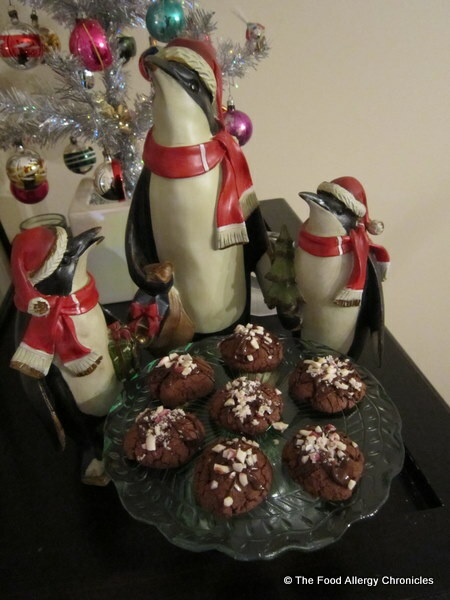 Posted on December 14, 2012 by Susan H.
I was sooo excited to see The Toronto Star’s Day 12 Cookie Calendar Countdown Cookie…Jae Steele’s Gluten-Free Thumbprint Cookies…a cookie that was already dairy and egg free! Love the name…’Sugar Plum Fairy Cookies’…plum jam is one of my favourites! I knew this was a cookie I definitely wanted to try. Click here for the original recipe from The Toronto Star. Unfortunately, I had forgotten how hard it would be to find brown rice flour let alone find one that was free of my son’s allergens…dairy, egg, sesame and peanut/tree nuts. 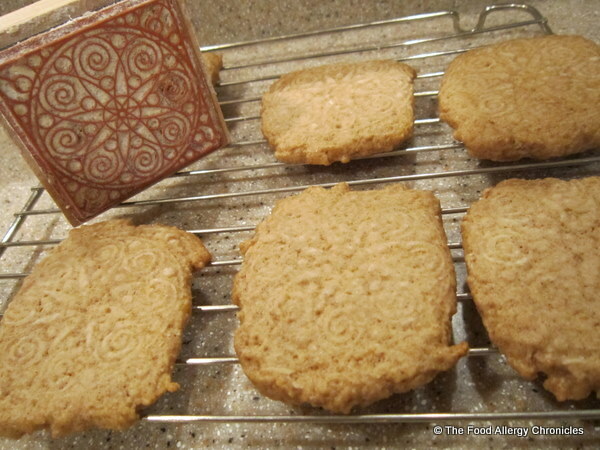 I had no such luck…so I opted for oat flour. Combining three of my favourite flavours…cinnamon, oats and plum jam…I loved them! In the end, I did need to adapt Jae’s recipe…I needed to increase the oat flour to 2 1/2 cups…it was still a bit wet and sticky but much more easily manageable. I also switched the nutmeg to ground ginger as a personal preference. I baked the cookies for 10 minutes, then indented them with my thumb and added the 1/2 tsp of plum jam and baked them for a further 6-8 minutes. I baked half the recipe at 350 F in the same manner as the above with similar results. Who does not love the combination of cinnamon, oats and chocolate! Try sprinkling in Enjoy Life’s Chocolate Chips for a kid friendly option! Tip 1: For those that can tolerate wheat free oats…I found Chateau Cream Hill Estates product, Lara’s Whole Grain Oat Flour. Right on the front of the package it reads, “FREE OF: Wheat, Barley, Rye Triticale, Spelt and Kamut.” On the side panel, is an advisory stating that “Current scientific literature suggests that the majority of people with celiac disease can tolerate eating limited amounts of pure and uncontaminated oat flour…” ending with “Please check with your doctor and/or dietician before introducing oats into your diet.” Click here for a link to their website to read more about their products. Tip 2: One can always make their own oat flour by processing whole oats in a food processor until a fine ground. Tip 2: Incidentally, finding the Greaves Plum Jam was not hard for me to find…MacMillans Orchards in Ajax sells many varieties of Greaves products. My personal favourite plum jam, as well as my mother’s, is Mirabelle Plum by St. Dalfour. Their no sugar added jams are only sweetened with concentrated grape juice and are gluten-free. I made some specifically for my mother to enjoy over the holiday season using St. Dalfour’s Mirabelle Plum Jam. I will have to tuck them away to keep me from eating them! P.S. Have you been following along with Jennifer Bain’s Cookie Calendar Countdown in The Toronto Star? Have you tried any of the cookies? What types of cookies entice you to bring out the bakeware? 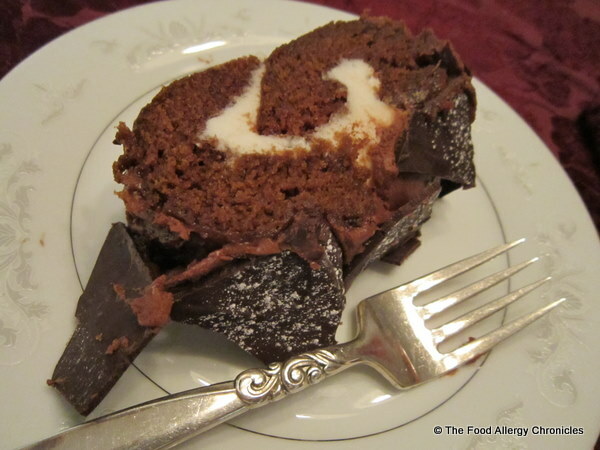 Would you consider adapting a recipe to suit your food allergens or do you prefer to buy prepackaged allergen friendly baked goods? Would love to hear from you! Posted on December 7, 2012 by Susan H.
While I wait to work out the kinks in my blog…this will be a link less and picture less post…I thought I would recount a conversation I had with Michael yesterday after school. It pertains to my previous post…Dairy, Egg, Soy and Peanut/Tree Nut Free Gingerbread Men. Apparently, my Dairy, Egg, Soy and Peanut/Tree Nut Free Gingerbread Men are legendary! For the past few days, Michael has been bringing in a few Dairy, Egg, Soy and Peanut/Tree Nut Free Gingerbread Men to school to enjoy at lunch. 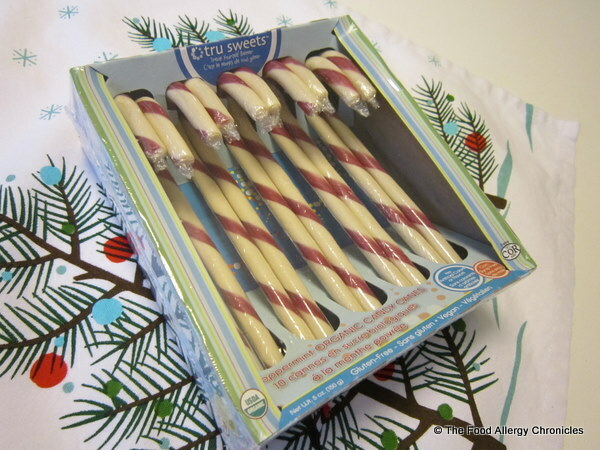 I had made a batch this past weekend to bring to a Christmas Party…I packaged a few for the children of our hostess. Michael’s Dairy, Egg, Soy and Peanut/Tree Nut Free Gingerbread Men were spied by his fellow grade school friends…they were deemed legendary! Michael’s grade school friends all grew up on my Dairy, Egg, Soy and Peanut/Tree Nut Free Gingerbread Men…I baked them in all kinds of shapes for all kinds of occasions throughout their grade school years. How sweet to think that my Dairy, Egg, Soy and Peanut/Tree Nut Free Gingerbread Men were so coveted! One friend, in particular, waited patiently for Michael to bring the cookies out of his lunch bag in anticipation that Michael would share…he did. As I looked in to the cookie container sitting on the counter, I noticed there were only two small Dairy, Egg, Soy and Peanut/Tree Nut Free Gingerbread Men left…I mentioned this to Michael. 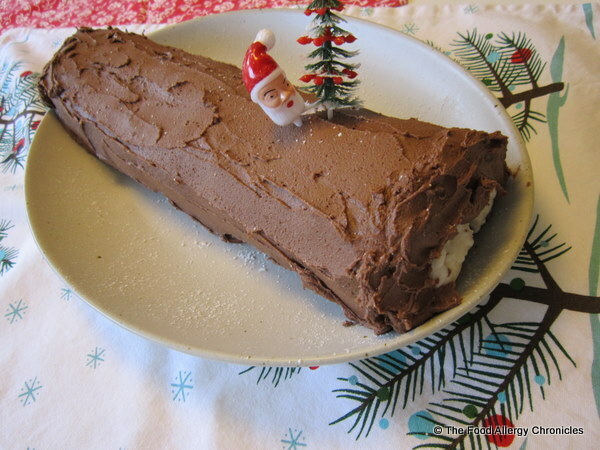 How about you…will you be busy with some holiday baking? What are the favourites in your household? P.S. Even my friend, Anne, that was just here visiting, requested the recipe for my Dairy, Egg, Soy and Peanut/Tree Nut Free Gingerbread Men…they truly are loved by all that try them! Posted on December 5, 2012 by Susan H.
So excited…Jennifer Bain, Toronto Star Food Editor’s 2012 Cookie Calendar Countdown has begun. Click here to learn more. 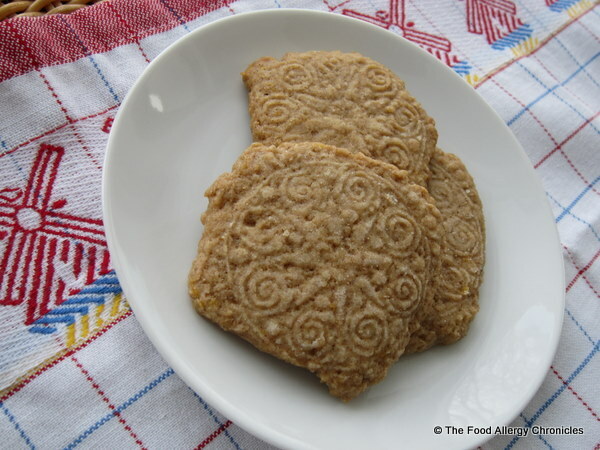 Day 1 was Ajitha Cyriac’s ‘chai inspired cookies’ she adapted from a Snickerdoodle recipe to please her four kids. 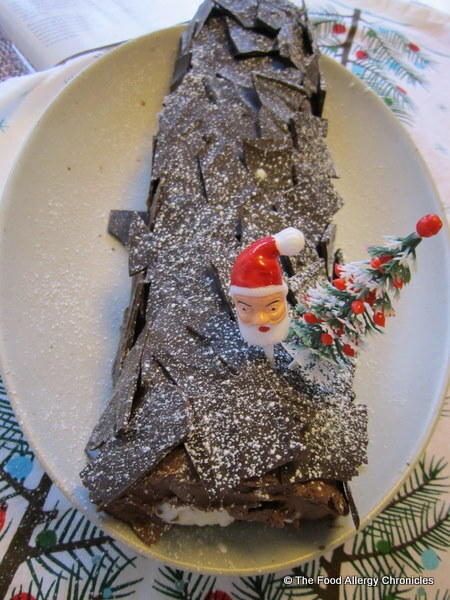 Click here for her original adapted recipe in the Toronto Star. I further adapted her adaptation to please my own boys’ food allergies. I replaced the butter with Earth Balance Vegan Sticks, (for a soy free version use Earth Balance Soy Free Buttery Spread) replaced the eggs with 1/2 tsp of baking soda added to the dry ingredients and 2 tbsp of water added along with the pure vanilla and omitted the pistachios. The timing was perfect…I had a houseful of hungry boys still around from Matthew’s birthday sleepover party…eager to try cookies. After a lunch of leftover pizza…the boys tried one. Matthew liked them…Michael made a face after the first bite…Carson thought they had a nice buttery aftertaste and William thought they would be more suited to adults as they were not very sweet. That evening, Andy and I had the pleasure of attending a Christmas party at our friends house. Our hostess has two boys who are also not too fond of ‘Indian sweets’ as Ajitha was quoted in the Toronto Star. I packaged up the Dairy, Egg, and Peanut/Tree Nut Free Diwali Chai Snickerdoodle Cookies to bring as part of my hostess gift. She was thrilled to receive her special hostess gifts. In addition to the Dairy, Egg, and Peanut/Tree Nut Free Diwali Chai Snickerdoodle Cookies, I decided to bake some kid friendly cookies that I know both my boys love at Christmas time…Dairy, Egg, Soy and Peanut/Tree Nut Free Gingerbread Men. One can never go wrong with Gingerbread Men…they are irresistible. Therefore, I made up 4 packages as there was another family attending the party with their two girls. Their mother was pleasantly surprised! I am looking forward to adapting more of Jennifer Bain’s Cookie Calendar Treats as the month continues. Stay tuned! 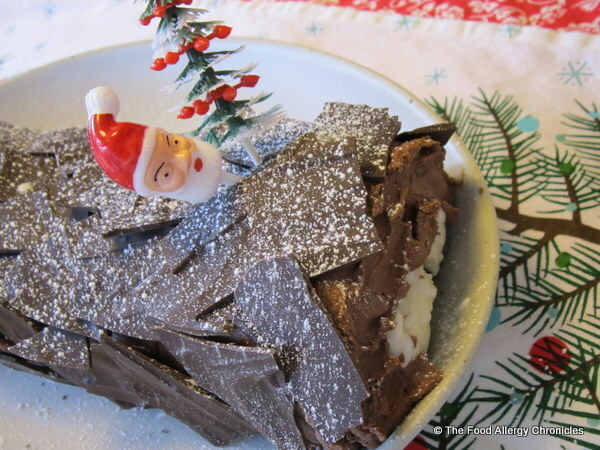 Have you started your holiday baking? What are your favourite family go-to holiday cookies? Are you following along with The Toronto Star’s Cookie Calendar Countdown? Posted on December 22, 2011 by Susan H.
I have been following Jennifer Bain’s Cookie Calendar Countdown to Christmas in the Toronto Star’s Living section throughout the month of December. 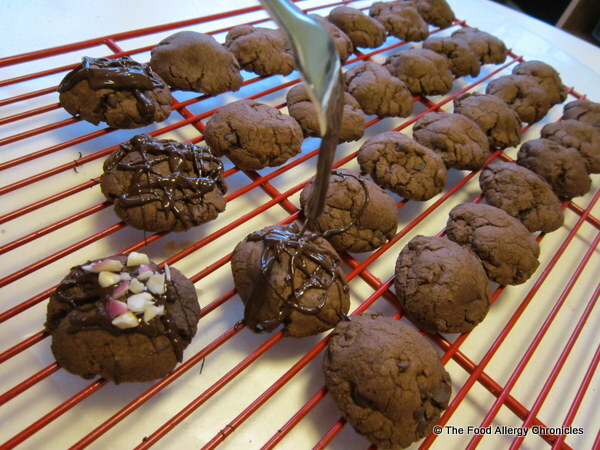 Posting my adaptions, on Facebook, to make each cookie recipe dairy, egg and peanut/tree nut free. I have been eager to put one of her recipes to the test. I adapted her Speculaas recipe (click here for recipe)… Dairy, Egg and Peanut/Tree Nut Free Speculaas Cookies. 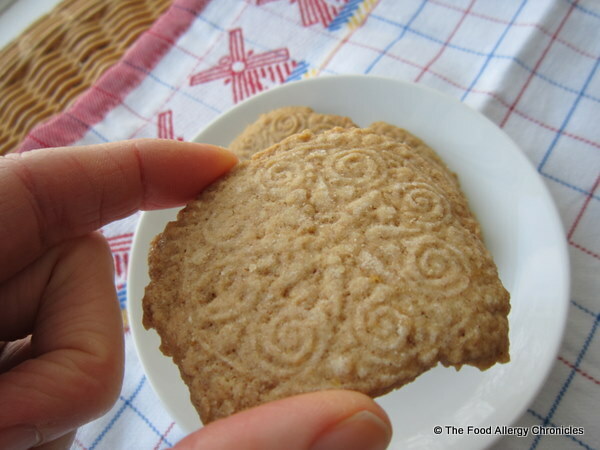 Speculaas cookies have always intrigued me…they are a traditional dutch cookie that are not too sweet and compliment a cup of tea or coffee with their touch of spicy simplicity. 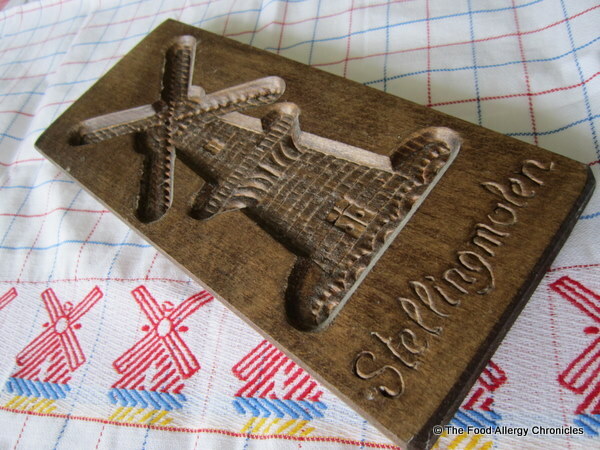 Typically, a carved wooden mold was used to create images on the Speculaas such as a windmill. This is such a mold I picked up while travelling in Europe in my youth. My mother and I set out in search of a similar mold. My mother suggested European Imports/The Dutch Market. Inside, the shop was filled with an assortment of Dutch products: baked goods, a deli, specialty food items, chocolates, tea towels, and wooden clogs. I couldn’t resist purchasing the beautiful windmill tea towel! Alas, we did not find a windmill mold. 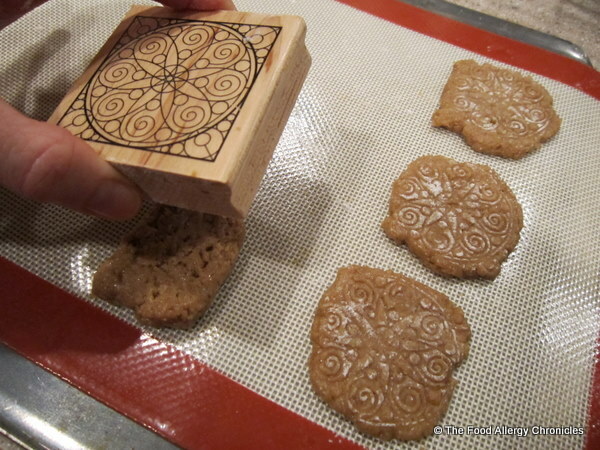 So we improvised…and went to Michael’s…and purchased a fancy mold for stamping the Dairy, Egg and Peanut/Tree Nut Free Speculaas. Although the stamp is not specifically made for pressing into sticky dough, it worked out pretty well. Make sure you keep flouring the stamp between pressings. For my dairy free version, I replaced the butter with Earth Balance. For a soy free version, use Earth Balance’s Soy Free Vegan Spread. I omitted the ground cloves, nutmeg, mace (my kids prefer less spice) and almonds. If you like a spicier cookie, I would increase the ginger and cinnamon. The dough was rather sticky. I thought I had made the cookies thin enough, however, I would have liked them thinner for a crispier cookie. My husband, on the other hand, loves softer cookies and felt these were perfect in texture and spice. I loved the touch of lemon! 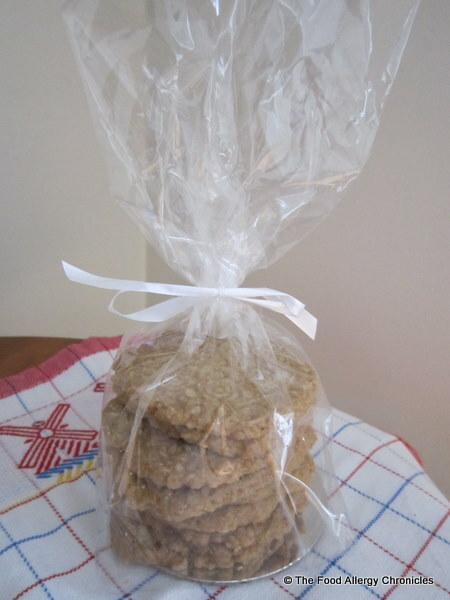 Tip: Packaged up, Dairy,Egg and Peanut/Tree Nut Free Speculaas make a great little something to give to family friends to thank them for all they do for, in my case, my mother. When you live a distance from a loved one…nice to know there are people that you can count on to be there for the ones you love. Thank you. P.S. 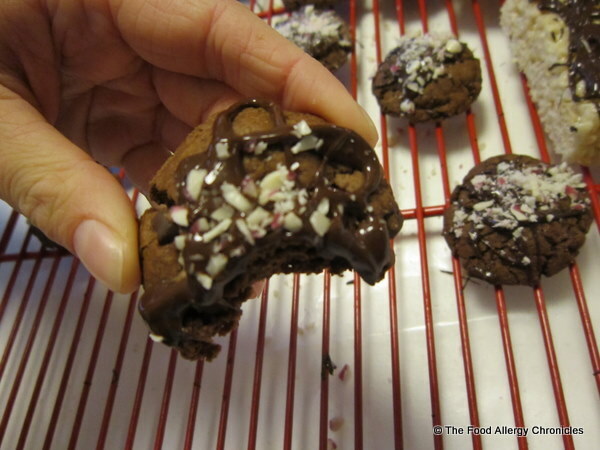 The Cookie Calendar, Day 17 adapted version: Dairy, Egg and Peanut/Tree Nut Free Double Chocolate Peppermint Crunch Cookies, will be posted on Friday. Matthew’s verdict…tasty with crunch. Michael’s verdict… very good. 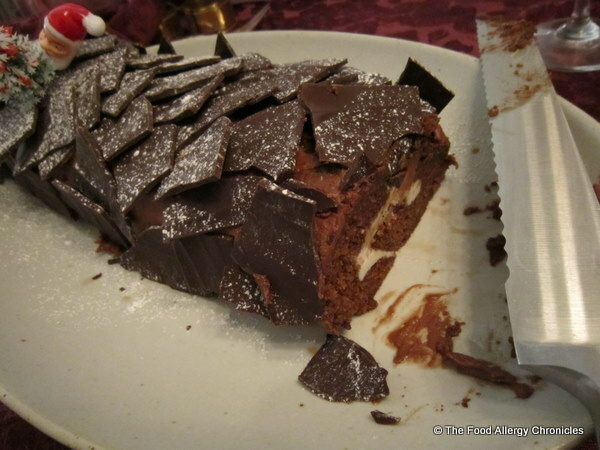 My verdict…amazing…a minty, fudgey decadence!